Do you struggle with what to eat? Perhaps you want quick meal ideas but you don’t know where to start? You are told it is possible to make a healthy meal in a short amount of time but you don't know how to simplify your choices. You are not alone. Nearly every day, I am asked by friends, family, patients, how to improve health without complicated systems, ingredients, or recipes that are time-consuming. So, in an effort to help you out, I am creating a “What I Eat in a Day” series so that you can get ideas for breakfast, lunch, snacks, and dinner that are time-efficient, nearly effortless, whole-foods based and easy on the waistline. If this interests you, go ahead and type “quick meals” in the comments section below. In today’s post, I’m going to share with you my quick and easy morning breakfast. While this is not the only breakfast I eat, it is my go-to most days when I want to keep things simple. If you are one for more complex breakfast ideas, this may not be the post for you. If you want to see more videos on health and wellness, feel free to subscribe to my channel and let me know what videos you wish to see in the future. A common myth that we believe is that eating healthy is expensive, time-consuming and boring; however, I’m going to show you some rather budget-friendly, quick and tasty meals to keep you on track toward your health and fitness goals (whether it is just to eat better or lose a few pounds). A quality protein powder that has zero added sugar. I really like Vega Protein and Greens in the chocolate flavor. Recently the formula has changed and it is creamier than it used to be. You can get this on amazon.com, Whole Foods market and sometimes Costco online has the chocolate flavor. I am not a big fan of the new vanilla flavor, personally. I use a scoop and a half to get about 30 grams of protein. I try to get my veggies in at breakfast time so, I always add in either 3 cups of fresh leafy greens or 1 cup of chopped frozen spinach. And here is a tip I learned from my friend, Dave: if you buy a large bag of greens a the store, put it in the freezer to keep it fresh and to prevent spoiling. The frozen leaves will be perfect for a cold smoothie and will last as long as you need. I use unsweetened coconut milk (the half gallon cartons at Trader Joe’s are really inexpensive). You can also use unsweetened almond, cashew, or hemp milk if you prefer. I use one cup of an alternative milk and one cup of filtered water. For fruit, I always choose low glycemic options that won’t spike blood sugar such as berries. At Costco, you can get a rather large organic frozen berry medley or easily find them at your local grocery store. I use about a ½ cup to ¾ cup of frozen berries in my smoothie. Lastly, I like to add spice and superfood powders. If you are new to the term superfood, it simply means that it is rich in compounds that are beneficial to your health and well-being. If you want to experiment, some of my favorite spices to add to my chocolate smoothie are cinnamon or cardamom. I recommend you buy Ceylon cinnamon as this is “true cinnamon”. Most cinnamon in the stores is "cassia" and is not as beneficial for your health as “true” cinnamon. Several things to know are that cinnamon is extremely high in antioxidants; it is anti-inflammatory; it helps to lower triglycerides and LDL cholesterols; cinnamon improves insulin sensitivity; cinnamon is protective against neurodegenerative diseases such as Alzheimer's; and cinnamon has anti-bacterial, anti-viral, and anti-fungal properties. Cardamom is high in antioxidants and may help to increase natural killer cell counts and thus prevent tumor growth. In addition, cardamom helps to decrease inflammation in the body; helps to heal ulcers; fights bad breath and cavities, and it has antibacterial and anti-fungal properties. Studies are inconclusive but suggest that it may increase your oxygen uptake during exercise; may help to lower blood sugar and improve fat utilization. I use about 1/8 to 1/4 tsp of cinnamon or cardamom. Macuna Pruriens powder is another one of my favorite health weapons. Macuna is also known as the velvet bean and has a taste similar to dried peas. Macuna has an affinity for the nervous system, the reproductive system, and the digestive system. Because of its ability to increase dopamine levels, it can help with sleep, mood, learning, coordination, and motivation. Macuna can increase libido in both men and women and sperm count in men. Macuna improves blood sugar levels and improves digestive elimination. I use about 1-2 tsp of mucuna. You can start small and gradually work up to 2 tsp if you wish. [NOTE: Before you purchase these superfoods, make sure that any pharmaceuticals you are taking do not interact with these foods or that any health condition that you have will not be negatively impacted by them]. Once I have all my ingredients, I blend them all up and drink immediately. As far as the timing of my breakfast, I will have it about 30 minutes to an hour of waking to get my metabolism going. 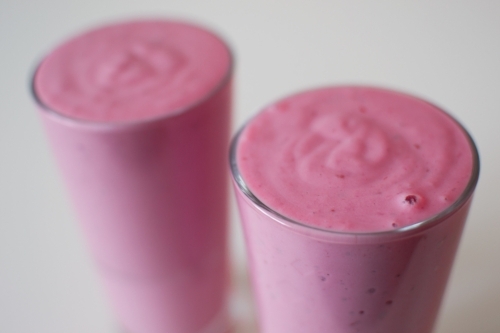 However, if I am working out first thing in the morning, I have this smoothie, directly after my workout. To make it too complicated. Make sure you have got all of your groceries purchased and stocked ahead of time so that you don’t have to guess what to put in your smoothie. If you aren’t too sure about adding superfood powders or spices, don’t worry about it. Just getting your protein and veggies in the morning is a good start. You can always add your powders later. I want to hear from you. If you have any favorite smoothie ingredients, let me know in the comments below. We can all learn from each other and share our favorite recipes. If you want to see more posts like this one, give this post a “like”. Feel free to share it with friends that you think would benefit from this simple recipe and come back to this site for more videos related to health and lifestyle.